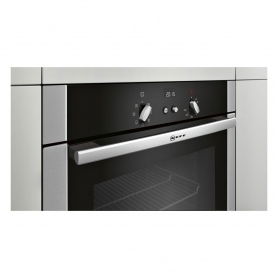 Conjure up culinary masterpieces with a range of great features on the NEFF B44S53N5GB. 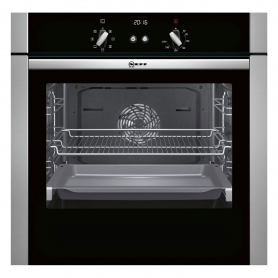 This single multifunction oven looks fantastic too, with its Black facia finish and famous Slide and Hide door. 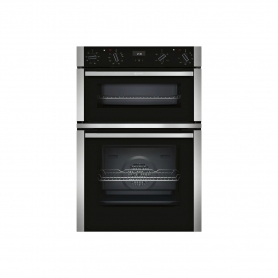 Single ovens are great because they offer lots of space, and the B44S53N5GB is no exception. It has a 67 litre gross capacity, meaning you can easily fit in bulky items for your Sunday roast or Christmas dinner. The space is divided over two shelves, which you can position on four levels, so you can cook multiple items at the same time. There’s also a telescopic shelf at the bottom of the appliance, which makes it much easier to get items in and out. The full-width enamel tray provided with this NEFF oven sits perfectly on the shelf, so you can get cooking right away. You could even grill bacon for breakfast, or some vegetables for a healthier dinner, as this model comes with grilling capabilities too. The CircoTherm® function is excellent at distributing heat across all levels inside the appliance, ensuring consistent and even cooking. This makes this NEFF oven ideal for all types of culinary activities, such as baking, roasting, and grilling. It also has a handy LED programmer and timer, helping to ensure that all your food is cooked to perfection, while the oven’s enamel lining makes it easier to clean. 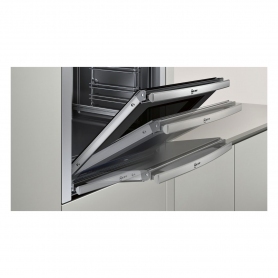 NEFF has designed the door of the B44S53N5GB to slide underneath the appliance when open. This novel idea keeps it out of the way while you’re lifting things in and out, giving you easier access. The door also features a halogen light and triple glazed glass, which allow you to see inside the appliance without opening the door. The triple glazing keeps heat trapped inside the appliance, improving its energy efficiency, and also helps keep the outer surface of the door cool to the touch. Keeping energy costs down is important, and investing in efficient appliances is a great way of achieving this. The B44S53N5GB is A rated for energy efficiency, meaning you’ll save money over lower rated appliances. The B44S53N5GB is powered using a 3-pin 13 amp plug, this means it can be plugged straight in to an existing socket and doesn't need to be hardwired. 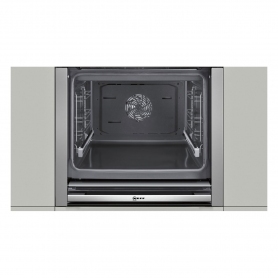 This single electric oven from NEFF is stylish, has a fantastic range of features, and is exclusive to Euronics and Agents stores. You won’t find it anywhere else - place an order for yours today.